Friend wants to buy curved screen TV. Is that a gimmick? He's looking at a 50" Samsung curved screen. 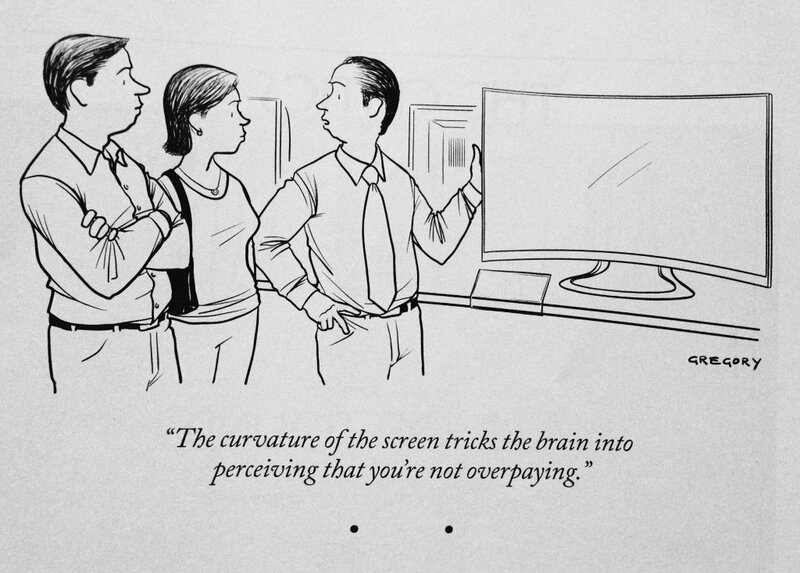 Re: Friend wants to buy curved screen TV. Is that a gimmick? Like a flashlight reflector or lens, there's one best spot for viewing, and it's probably fairly small compared to a traditional screen. And I think if there's any benefit to be derived, it would come from sitting closer than most people think is 'right' or comfortable. I think most people sit back too far from TVs in general, but I prefer an immersive experience. I haven't seen any reviews that speak to a curved screen providing a superior viewing experience. Maybe if one used it for a month or two and went back to a flat screen, they'd feel the difference. There's no telling who will/can appreciate it. I'd hold off unless a) the set is otherwise a good performer, and b) your friend can get a really good deal on said good performer. I always thought it was a gimmick, and that for some reason it was originally easier to make curved OLED screens in large formats, hence the need for the gimmick (don't quote me, no idea if that's true or not). I'd still buy a flat screen myself, especially if I was planning to wall mount it. It's a good idea for a large or ultrawide computer monitor because one person uses it at a time and sit in the ideal location. Seeing as frequently more than one person watches a TV at a time, either one or none will be able to sit in a curved TV's sweet spot. That seems bad. One of my clients has a large curved screen model. I would not bother with such a display myself, but I have noticed, when I have had theirs on, that you very quickly forget that it is curved, and that it picks up fewer reflections from the nearby window. ....does it curve to the left.....or to the right....??? Never seemed like something worth paying extra for. I have a curved monitor for my office set up. I love it. I have a buddy who has a very large curved tv - more because of the novelty that he mounted on a curved wall of the approx same radius. I love them, although I don't have one. In fact, when I've stared at those at Costco, I've noticed that, "I think I've been standing here too long" feeling; it's quite immersive. I'd pay a little extra for it. Best viewing angle is.....limited. As for reflection. I’ve never had that issue with any of my displays. Edited 1 time(s). Last edit at 05/18/2018 04:09PM by Carm. How close is he sitting? Reflections are pretty specific to the location. Might not matter to most people. The curve does help in one setup that I have seen. 50" seems so small these days. I attribute much of that not only to the fact that 65" and bigger screens are pretty common, but also getting away from rear-projection made their footprint much smaller, more acceptable. And being 'only' 50", I still think the best viewing spot is very small. And to get the most out of its resolution (1080/4K?) means sitting closer than most people are typically accustomed. Ok, that has to look pretty cool, even when the TV is off. I've got to go into town for provisions, so I'll look for a curves screen. I didn't notice any last trip. Without longish watching, it would be difficult to perform the true test- go back to a flat flatscreen and see if you're missing anything, even if one can't articulate that it is. At least that's what I'd like to try before buying. That's probably possible with Costco. That's what I told him. He already has a 50" PANASONIC plasma. I haven't tried one yet, but I think a 50 inch curved 1080p screen is borderline gimmick from 10 feet away. A 65 inch screen would be better. I was reading a review, they mentioned that 70 and bigger would benefit the most from curved display. My 32" makes me feel inferior somehow. But then again, lying in bed with my laptop on my chest makes your massive wall screens "look" tiny in comparison. And my cat lounges on my belly with the heat exhausting right on his side. Everyone is happy. Edited 2 time(s). Last edit at 05/19/2018 01:59PM by Racer X.